Need a notecard to go with that gift? Need a notecard to go with that gift? 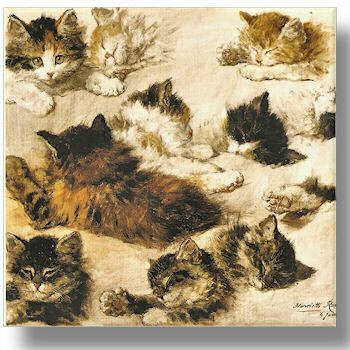 Quality notecard by Simon Elvin that is just picture perfect featuring on the front of the card 'Various Studies of Cats' from an original painting by Henriette Ronner-Knip, 1821-1909. Even if you are not a cat lover you will appreciate the beauty of this picture. Need a notecard to go with that gift? Quality notecard by Simon Elvin that is just picture perfect featuring on the front of the card 'Various Studies of Cats' from an original painting by Henriette Ronner-Knip, 1821-1909. Even if you are not a cat lover you will appreciate the beauty of this picture. Blank on the inside for your own heartfelt words. Includes envelope. If you want this card included with a gift you are ordering from Amys Gifts and that is to be shipped directly to the recipient, please fill in the text box with a brief message and Amys Gifts will handwrite this on your behalf.